The importance of contextual factors in influencing quality improvement and implementation (QI&I) initiatives is broadly acknowledged. Existing treatments of context have primarily viewed it as static and distinct from interventions themselves. The objective of this study was to advance understanding of the complex and dynamic interaction between context, intervention, and implementation strategies. Using the Model for Understanding Success in Quality (MUSIQ), we aimed to better understand the roles of, and inter-relationships between, contextual factors within QI&I initiatives. Secondary analysis was performed on qualitative data collected as part of two studies: (1) an evaluation of a state-wide obstetrical quality improvement (QI) initiative, and (2) a study of the use of Plan-Do-Study-Act cycle method in QI projects. Electronic coding databases from each study were reviewed jointly. Data analysis was initiated deductively using MUSIQ as a template. Codes were added in an inductive manner. All original factors in MUSIQ were observed to be important in the QI initiatives studied and new factors were identified. Three distinct types of context were identified; the setting(s) of care in which QI&I takes place (Type 1); the context of the team conducting a specific project (Type 2); and the wider context supporting general QI&I (Type 3). The picture of context emerging from this study is a dynamic one with multiple, closely-linked factors operating at different levels in a system that is constantly changing in response to QI&I initiatives. To capture this complexity, a revised model (MUSIQ v2.0) was created positioning use of structured QI&I approaches as the focal point and demonstrating how context influenced effective use of these approaches, and in turn, how these approaches supported teams in navigating context by adapting interventions to fit local settings. MUSIQ is a useful tool to explore the roles of, and inter-relationships between, contextual factors within QI&I initiatives. The revised model may help address some existing controversies about how context influences QI&I success and help ensure that future research efforts consider context not as static background, but as a complex system that is constantly changing, tightly-linked, and governed by feedback loops. The history of quality improvement and implementation (QI&I) in healthcare is replete with examples of initiatives that show either considerable variability in impact across settings, or an inability to replicate previous successes when applied in new arenas . The context in which improvement initiatives are implemented is frequently cited as an explanation for this variability [2, 3], but we have limited understanding of what this means in practice. In part, this is because much research continues to focus on technical aspects of interventions (what works) and the process of implementation (how it works). In addition, there are significant boundary challenges in defining context. While context is typically recognised as everything that surrounds an intervention or improvement effort , in reality, the boundaries between an intervention, the environment in which it is delivered, and its effectiveness are blurred . Finally, despite the growing body of evidence demonstrating that the context in which interventions are introduced influences their successful implementation, those examining the role of contextual factors in QI&I initiatives conventionally treat contextual factors as static, background elements, with little reference to the complexity of the environments into which interventions are introduced. A range of heuristics have been proposed to understand the role of context in implementation and improvement efforts including the Promoting Action on Research in Health Services framework,  the Consolidated Framework for Implementation Research,  Receptive Contexts for Change,  Organisational Readiness for Change,  Emotional Dynamics,  Organising for Quality,  the Knowledge to Action Cycle,  and the National Health Service (NHS) Sustainability Model  among others. The emergence of a large number of models attempting to explain similar phenomenon may be a result of the difficulty in codifying a concept that is inherently complex. Researchers are challenged by trying to draw clear boundaries around systems which may be subject to a variety of social contextual and organisational factors (among others) at different times . Secondly, researchers disagree on the extent to which context is considered concrete and measurable versus something that is perceived and socially constructed [15, 16]. Thirdly, there is confusion about the extent to which context can be described by lists of important factors, versus the extent to which such factors are dynamic and interact with each other, the intervention and implementation process [15, 17–19]. Perhaps one of the most important disputes is the extent to which different aspects of context are navigable or modifiable [20–22]. More recent work applying complexity science to better understand the impact of context in QI&I interventions has the potential to provide the framing needed to better align the field . Recent work by Hawe and colleagues, [24, 25] as well as work by May,  advances a dynamic understanding of the relationships between an intervention – modelled as a series of events – and the context in which it is implemented. This work – which focuses on context as a complex adaptive system – has the potential to transform our understanding of how and why interventions work in some settings and not others . Actors in a health system are understood to respond individually and collectively to changes in their environment in a dynamic way over time, and in ways that may eventually result in new behaviours at a system-level (self-organising behaviour) [25, 26]. Although there is growing interest in the potential of insights from complex systems theory to inform our understanding of context in QI&I, real-world applications of systems thinking to this problem have been few and far between. This study employs the Model for Understanding Success in Quality (MUSIQ)  to help understand context. MUSIQ was originally derived from a systematic review of quantitative evidence  and expert consensus . It has subsequently been tested in an exploratory quantitative analysis of 74 Quality Improvement (QI) projects . MUSIQ identifies 25 contextual factors across multiple nested levels of the healthcare system. Importantly, it also suggests key relationships among these factors. 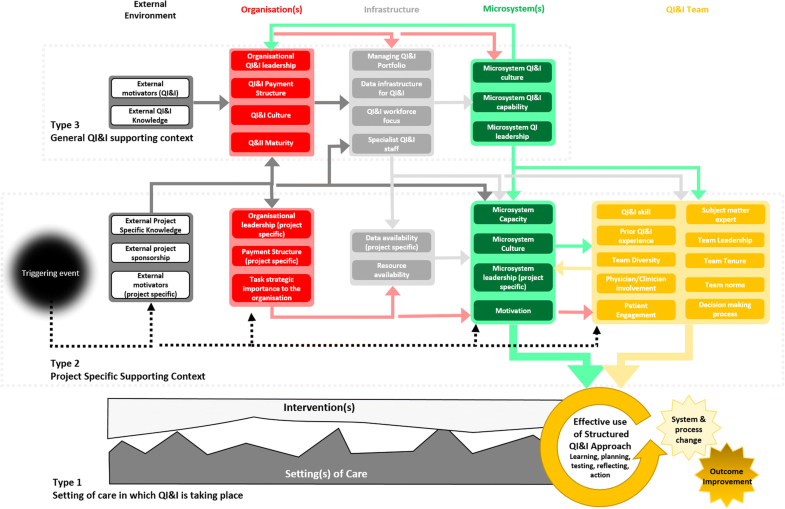 MUSIQ is distinguished from the other models currently guiding this area of research (those models listed above) by its attention both to generating a taxonomy of the contextual factors affected QI&I initiatives, and in explicitly recognising the dynamic and time-contingent nature of interactions between the contextual factors, and between the context and the interventions when implemented in a complex system. The objective of this study is to advance the understanding of the complex and dynamic interaction between context, intervention, and implementation strategies. Using the Model for Understanding Success in Quality (MUSIQ), we aimed to better understand the roles of, and inter-relationships between, contextual factors within improvement and implementation initiatives using qualitative data from a series of QI&I efforts and to present an evolution of the MUSIQ model in light of these findings. This study employed secondary data analysis of qualitative research undertaken as part of two independent studies. Both studies used MUSIQ as a model to guide study design and interview constructs. Study A was a process evaluation of a collaborative QI programme. Study B was a qualitative study on the use of plan-do-study-act cycles (PDSA) in QI projects and the influence of context on effective use of PDSA cycles. Data were collected as part of a process evaluation of an Ohio Perinatal Quality Collaborative (OPQC) QI initiative to improve birth registry accuracy and reduce elective deliveries before 39 weeks in Ohio maternity hospitals [institutional review board approved 2013-0705]. Seventy-two hospitals were divided into three balanced groups that participated in monthly 1:1 coaching webinars with an OPQC QI facilitator for the first 3 months, a single face-to-face learning session designed to build community, and monthly group webinars to share ideas and track progress. As part of the process evaluation, the QI operational team leader (QI team leader) and obstetrician lead from a sample of hospitals were invited to participate in telephone interviews conducted within 1-month of project completion. Open-ended questions and follow-up probes were used to understand: how and why the hospital chose to participate in the OPQC project; changes made as part of the OPQC project; aspects of local context that were barriers or facilitators of the project; and ways in which the hospital supports, or does not support QI. Data analysis was initiated with a deductive approach, utilizing the question guide as an initial template for the coding framework, and then proceeded in an inductive manner [31, 32]. Codes and supporting quotes from transcripts were recorded in an electronic database (Microsoft Excel 2007). Data were collected as part of an international study to explore the use of PDSA cycles in experienced QI organisations. [research ethics committee reference: 13/WM/0436] Two hospitals participated (located in Scotland and USA) and four active QI projects were identified from each site. An ethnographic approach was utilised including interviews, observations and document analysis. Multiple staff were interviewed from each project team, ranging from supporting QI staff to organisational senior leaders. Open-ended questions and follow-up prompts were used to understand the use of QI methods including PDSA cycles, the facilitators and barriers to their use and how this was affected by contextual factors. Data analysis was initiated with a deductive approach, utilizing the principles of PDSA conduct  and MUSIQ as theoretical models, and then proceeded in an inductive manner [36, 37]. Codes and supporting quotes from transcripts were recorded in an electronic database (Nvivo 10). In total over 50 h of interviews were coded from 59 staff (13 from Study A; 46 from Study B) from 14 project teams (8 from Study A; 6 from Study B) in 10 different organisations. (8 from study A; 2 from Study B). In addition, 16 coaching calls and 4 group webinars from Study A documented PDSA cycles in Study B were coded. Thematic analysis was conducted against items in the original MUSIQ model. In addition to deductively coding factors already present in the MUSIQ model, authors also used inductive coding to identify new factors and understand relationships between factors and successful QI&I. Coding was conducted independently with two coders (HK and JR) regularly coming together to review coding and discuss and agree on new coding items and definitions. Through a number of iterations, a final coding structure was agreed upon. At this point coders reviewed each other’s coding in full to ensure that definitions were understood. Any disagreements were resolved by consensus. All original factors in MUSIQ were observed in both qualitative studies. New factors, not previously included in MUSIQ, were also identified. Contextual influences at all levels (microsystem, QI&I team, infrastructure, organization, and external environment) were noted and there were many examples of important relationships between contextual factors as hypothesized in MUSIQ . We present in detail the key contextual factors discussed by participants in these studies, evidence supporting the complexity of the relationships between all factors that were observed, and an overview of three different types of context that we identified in our analysis. All factors previously identified in MUSIQ were identified in our qualitative exploration. Analysis contributed to alterations to original contextual factors for three reasons: broadening the definition of original factors (n = 2); increasing specificity of original factors (n = 5) to clarify whether they related to project specific or general factors; and the introduction of new factors not previously included in MUSIQ (n = 6). The terminology of all factors was modified from QI to QI&I to make explicit the application of the model to both quality improvement and implementation initiatives. A total of 36 contextual factors were described in the qualitative data examined from these two distinct studies. A full list of contextual factors identified with associated definitions is provided in Additional file 1. Two of the existing MUSIQ factors were modified to broaden their definitions. Senior Project Sponsor was renamed Organisational Leadership (project specific) to reflect the fact that organisational leadership for a specific project may be required from multiple individuals rather than an individual project sponsor. Physician involvement was renamed to Physician and Clinician Involvement to recognise the role of other healthcare professionals, including nurses and allied health professionals, in supporting certain QI&I efforts. In addition to the modifications made to more clearly define the existing MUSIQ factors, six entirely new factors were identified based on the qualitative data examined in this study. The new factors along with representative quotations illustrating the importance of these factors are detailed in Table 1. The original MUSIQ model proposed a number of relationships between factors to support a deeper understanding of the mechanisms of action by which context influences QI&I success. In exploring in-depth qualitative accounts of QI&I efforts, the authors were able to identify examples of these relationships. In many cases, both positive and negative examples were identified, for example describing the benefit of having organisational Data Infrastructure for QI&I on QI&I team Decision Making as well as the challenges when such infrastructure didn’t exist. In addition, we found examples of two-way relationships, for example Microsystem QI&I Leadership was able to influence Organisational QI&I Leadership as well as vice versa. Key relationships that existed in the data related to how improvement is mediated through use of systematic, structured QI&I approaches. The use of structured QI&I approaches influence, and are influenced by, contextual factors in a non-linear way (Fig. 1). In the original MUSIQ model success was depicted as the implementation of system and process changes with resulting outcome improvement. The use of a structured QI&I approach to implement system and process changes was implied, but not explicitly defined. Qualitative data from this study demonstrated the importance of having a structured approach to support learning, planning, testing, reflection and action to introduce an effective change through an iterative process that adequately accounts for contextual factors. Effective use of a structured approach was observed to support teams in understanding and navigating the context or setting(s) of care in which evidence or other intervention(s) are introduced, and negotiating the changes that need to take place. On the other hand, the context of the team conducting a specific project and the wider context supporting general QI&I were observed to influence how effectively a team was able to utilise a structured approach to iteratively learn, test changes at a small scale and then implement broadly. Examples of these relationships are provided in the following section. Similarly, using a systems’ lens to view change, as encouraged in QI methodology, can help teams identify and institute changes to related practices or processes that needed to be made to support implementation of the target intervention, by recognising the degree of connectivity between agents and processes in the system. Our data suggest this was particularly important when implementation of the target intervention was dependent on work that happens in other parts of the mesosystem. However, the tightly-linked nature of intervention context was also emphasised by the frequency with which wider organisational issues linking to staff capacity and capability were identified in this study as barriers to introducing new ways of working. Organisational or external factors influencing staff availability could not always be influenced by the team, and as a result teams had to adapt their intervention and improvement attempts to work within available resources. Motivation among microsystem staff was a critical factor in successful improvement. If microsystem staff are not motivated, then the team will have difficulty implementing change and executing a cycle of learning to identify whether the changes they are interested in making result in improvement. Professional diversity within the team, particularly physician and clinician involvement, increased the motivation of microsystem staff to test changes. Support and motivation for a specific change effort may also be influenced by environmental factors such as external motivators for project participation (e.g. incentives, macro level competition) and project sponsorship. External project sponsorship can facilitate use of QI methods and other structured implementation approaches through building motivation, providing resources, and facilitating knowledge sharing around the project. The influence of project specific context was also illustrated as the extent to which the organisation leaders provide support and resources to help the team overcome barriers and obstacles encountered during the specific project. The ability of a team to effectively use structured QI&I approaches is influenced by the extent to which the wider organisational context is supportive of improvement and evidence implementation at micro, meso and macro levels. For example, Organisation QI&I Culture is defined as the values, beliefs, and norms of an organisation that shape the behaviours of staff in pursuing QI&I. A strong culture supportive of QI&I is reflected by staff that are willing and able to participate in QI&I approaches to test and implement changes. A key observation that was identified from the data was that individuals, teams, and organizations were thinking about and addressing three different types of context: type 1 represents the context of the setting(s) of care where QI&I takes place (navigated and negotiated by the use of a structured QI&I approach); type 2 represents the project specific supporting context; and type 3 represents the wider QI&I context (contexts which influence the effective use of structured QI&I approaches). Each type of context is distinguished by its relationship to the use of structured QI&I approaches and its proximity to the specific intervention or improvement being made. The ways in which these three types of context emerged from the qualitative data are illustrated in Table 2 with an example from each study. In its original form, MUSIQ focused mainly on context Types 2 and 3. Of the 36 updated MUSIQ factors we have classified 23 of the factors as Type 2 and 13 as Type 3. An updated model conceptualization of MUSIQ is provided in Fig. 2. The relationship between structured QI&I approaches and Type 1 context was not included in the original MUSIQ model. We noticed that we had less coding groups for Type 1 context and reflected that this maybe an artefact of our study designs which had sought to understand the influence of context on QI, rather than how QI&I approaches support the adaption of interventions to fit with local settings of care. Common Type 1 context themes emerged that related to modifying interventions to fit with practices or processes, making changes to related processes or policies, and modifying or adapting changes to take into account local capacity and capability. However, the specific requirements to modify an intervention or local care setting were observed to be different for each project or intervention. We therefore did not feel it was appropriate to identify common context factors for Type 1 context based on our analysis to date. We have instead represented this diagrammatically as the desire to fit interventions or changes to practice within the local setting. In this qualitative exploration of MUSIQ, we confirmed that all original factors in MUSIQ were observed to be important in the QI initiatives studied and new factors were also identified. In addition, we identified three distinct types of context that are important in QI&I initiatives: the setting(s) of care in which QI&I takes place (Type 1); the context of the team conducting a specific project (Type 2); and the wider context supporting general QI&I (Type 3). The picture of context that emerges from the qualitative application of MUSIQ in real-world QI& I efforts is one that exhibits many of the classical features of a self-organising, complex system . The context in which interventions are implemented has multiple elements, operating at different levels, and influencing improvement and implementation at different time points in ways that may bring about process and system-level change. Feedback and adaptation – particularly at the micro-system level – emerge as powerful influences on the direction of change for QI&I initiatives. Evaluating QI&I interventions with a complex system lens represents a significant step forward in addressing enduring controversies over the influence of context on QI&I initiatives and the approach to studying this phenomenon. A new version of MUSIQ (MUSIQ v2.0) was developed to better address this complexity. Importantly, the progress of improvement work in any given context – as outlined in Fig. 2 – is demonstrably non-linear, a key feature of a complex system. The relationships between the different types of context identified in this analysis are many and varied. The explicit articulation of distinct relationships between factors was a unique contribution of the previous model. Our qualitative analysis has extended the original model by revealing what these relationships look like, how different factors interact to influence project success, and importantly the ways in which these interactions may change over time. Each participant’s description of the role of context in their efforts revealed, either explicitly or implicitly, a dynamic situation in which factors are constantly interacting and feeding backwards or forwards across the types of context identified in Fig. 2, reinforcing the view of context as mediating and actively influencing improvement [14, 19]. Qualitative exploration allowed for a deeper understanding of these relationships that was not possible in previous quantitative studies and was masked by the simplification necessary when originally developing MUSIQ. MUSIQv2.0 newly introduces the effective use of a structured QI&I approach as a focal point for understanding the influence of context and demonstrates how the structured QI&I approach is tightly linked to the three types of context identified in the study in different ways. The updated model provides a clear mechanism of action between contextual factors, the use of a structured approach, and the achievement of desired changes in system, processes and outcomes in a way that emphasizes the tight-linkages between these three aspects affecting change. Because complex systems are often resistant to change on their own, any desired change must be deliberate and must be allowed to occur over time. Our studies revealed how attempts are made to intentionally modify aspects of context, reflecting greater or lesser degrees of resistance to change for each “type”. This is clearest in type 1 context where structured approaches are used to understand the setting of care and make modifications to the intervention or related care practices and process to support successful implementation. Our findings suggest that modifications to type 1 context can proceed comparatively rapidly over days, weeks or months. In type 2 context, teams can modify context by increasing levels of motivation or support for a specific project and organisation leaders can modify context in the way they support the team’s efforts. Effective use of structured QI&I approaches in and of itself can influence context at this level, for example by utilising data to create a tension for change and foster leadership support, or engaging staff in iterative development of solutions to increase their levels of motivation. These types of changes to type 2 context related to garnering support for a project or building relationships, typically occurs over months to years. Type 3 context is generally modified by organisational leaders who, for example, create an organisational direction for improvement and make investments in the strategic development of a culture of QI&I and supportive resources including specialist QI&I staff and data infrastructure. Modifications to type 3 context were noted to proceed slowly taking years and decades to influence and embed culture and infrastructure for improvement, which is consistent with previously studies of organisational development . Relationships – in the form of feedback and feedforward loops – between different context types were also observed. For example, strong leadership in relation to a specific project (Type 2) could have a positive impact on leadership in Type 3 context. The success or failure of a specific project to improve outcomes was also observed to impact motivation or resistance within Type 2 and 3 contexts. This demonstrates the relationships between context types and the complex and dynamic way in which they interact. The three types of context and their key features and relationship to QI&I approaches are presented in Fig. 3. The study is comparable in size to previous leading analyses of context in healthcare [8, 40–42] and was informed by a large and diverse sample of organisations and project types when compared to previous studies. Observations made in this study from both sources of qualitative data adds to the generalisability of the findings. Limitations of the study include the fact that both analysed studies were designed to view context through the lens of local QI projects. Although many projects in these studies were influenced, in part, by policy or financial (macro) drivers, further work to explore more policy driven initiatives may identify more environmental factors important for both project specific and general QI&I context. Secondly, the study utilised secondary analysis of qualitative data that had been collected primarily for other research studies. Whilst MUSIQ was used as a theoretical model to inform the design of both studies, there is a now a need to conduct primary research utilising this updated model (Fig. 2). Such research could also more explicitly target observations to understand further how context is intentionally modified, and to more directly explore how context impacts use of QI&I approach and project outcomes. Thirdly, while the data supports the importance of Type 1 context in QI&I success, we were unable to deeply explore themes underlying Type 1 context based on the type of secondary data available thus further research is required in this area. Finally, it was not possible to link findings from this analysis to project outcomes (for study B), so we cannot be definitive about which contextual factors are particularly prominent for interventions that are successful by comparison with those that are not. MUSIQ v2.0 captures the intricate and complex relationship between context factors and how they influence QI&I efforts over time and provides insights to the practical reality of navigating and negotiating change. The three different types of context will have practical applications for those on the frontlines of QI&I by helping highlight the dynamic environment that teams are required to understand and navigate to support success of their projects. Further work is needed to understand how to translate and package these findings into useful tools to provide practical guidance to practitioners, managers and policy makers. In using MUSIQ to analyse qualitative data we found that context is complex, changing dynamically overtime, and is influenced by individual, team, organisation, and system characteristics and the relationships between them in a non-linear way – all distinctive features of a complex adaptive system. We were also able to identify three distinct types of context including, the setting(s) of care in which QI&I take place (Type 1), the context of the team conducting a specific project (Type 2); and the wider context supporting general QI&I (Type 3). These insights have resulted in a new version of the model, MUSIQ v2.0, which may help address some existing controversies about how context influences QI&I success and help ensure that future research efforts consider context not as a static background factor, but as a complex system that is constantly changing, tightly linked, and governed by feedback loops. Julie E. Reed and Heather C. Kaplan contributed equally to this work. The authors would like to acknowledge Susan Sherman, DPA and Charlena Cleveland Hargitt for their original work in the qualitative analysis of Study A., and Dr. Chris McNicholas who contributed to data collection of Study B and to early conversations that inspired the secondary analysis presented in this paper. Support for the qualitative research conducted as part of study A was provided by cooperative agreement U19HS021114 from the Agency for Healthcare Research and Quality. The content is solely the responsibility of the authors and does not necessarily represent the official views of the Agency for Healthcare Research and Quality. Study B originates from independent research commissioned by the National Institute of Health Research (NIHR) Collaboration for Leadership in Applied Health Research and Care (CLAHRC) programme for North West London. JR was also financially supported by Improvement Science Fellowship from the Health Foundation. The views expressed in this publication are those of the authors and not necessarily those of the Health Foundation, the NHS, the NIHR or the Department of Health and Social Care. JR and HCK independently developed study designs related to the MUSIQ model (study A and B). JR initiated collaboration with HCK to jointly explore the qualitative findings related to the MUSIQ model. JR and HCK both analysed and interpreted findings and proposed the new typology. SAI contributed to analysis and interpretation of results using a complexity lens. JR and HCK jointly drafted the manuscript. All authors revised the manuscript and reviewed and approved the final manuscript.